With the Club progressing plans to create a new stadium at Bramley-Moore Dock, opportunities to regenerate North Liverpool and deliver a community-led legacy at Goodison Park are unlocked. Everton is a club deeply rooted in its community. 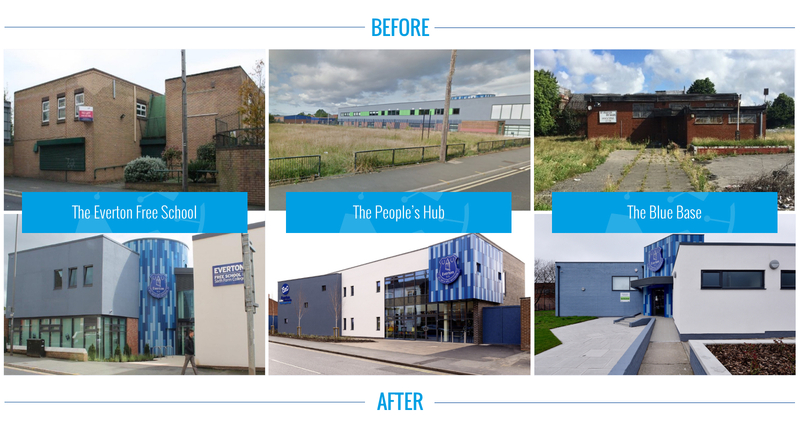 In recent years it has changed the face of the area around Goodison Park, transforming derelict sites into thriving destinations and helping to transform lives. The Everton Free School and Sixth Form College, The People’s Hub, the transformation of the former St Francis De Sales Parish Club into The Blue Base as well as plans for a new drop-in mental health facility, to be called The People’s Place, represent an £8million investment in the area. Led by Everton in the Community, this work has a value far beyond the raw investment figures in new bricks and mortar. Liverpool 4 is an area which has more than its share of social challenges and the work of the Club’s charity reaches thousands of people each and every year. From teenagers taking their first steps towards a rewarding career to elderly groups who meet to tackle the plight of loneliness, the Club already meets many of these challenges head-on. But the plan is to create additional facilities which will, in turn, help and support more people. The Club’s vision for Goodison Park is to build on the recent community investments by creating new community assets. These facilities will mean community activity can take place not just on matchdays but 365 days a year. The new community-focused development on Goodison Park will support local businesses and residents for generations to come by creating facilities which respond best to local needs. Although final plans for the development are still to be determined, they could include health facilities, education amenities, community meeting rooms, leisure provision and homes. These plans will be refined in the coming years, overseen by a Trust Board and incorporating detailed consultation with the local community. Everton in the Community will lead on this planning and community engagement with the proposal that building work will begin as soon as Everton has completed its move to a new stadium at Bramley-Moore Dock. This new Goodison Park and the existing community buildings surrounding it will ensure the heartbeat of the Club remains in the local community it has called home for more than 125 years. Our investment in the Goodison Campus is clear evidence of our commitment to our neighbourhood which has been our home for the last 125 years. Liverpool 4 will always be in our heart and our soul. The physical regeneration the Club is contributing to Liverpool 4 is very important to us. It is all part of us putting physical buildings in the community so we can deliver our growing social programmes and to have a campus around Goodison which can continue to provide a social benefit. I’ve long been a huge admirer of the work of Everton In the Community. The Club has been a pioneer in professional football when it comes to drawing attention and supporting issues such as disability sport and mental health and, more recently, education. What goes on at Everton Football Club in terms of community, education, young people all the way through enterprise and then into business – every aspect of the local community Everton see themselves at the centre of and they’re a real example to other clubs.